After a Landmark Legal Ruling, Will CIA Torture Victims Finally Have Their Day in Court? | Democracy Now! After a Landmark Legal Ruling, Will CIA Torture Victims Finally Have Their Day in Court? staff attorney at the ACLU National Security Project. retired colonel and former military intelligence officer. He knew James Mitchell and Bruce Jessen at the SERE school in Spokane. A federal judge has allowed a landmark lawsuit to proceed against two psychologists who designed and implemented the CIA’s torture program. Psychologists James Mitchell and Bruce Jessen reaped more than $80 million for designing torture techniques used by the agency. The case was brought by Suleiman Abdullah Salim and Mohamed Ben Soud, two survivors of the program, along with the family of Gul Rahman, who froze to death at a CIA black site in Afghanistan. All three men were subjected to torture techniques that Mitchell and Jessen created and helped implement, including beatings, being held in coffin-sized boxes and being hung from metal rods. We speak with ACLU lawyer Dror Ladin, who filed a lawsuit on behalf of torture victims, and with former intelligence officer Col. Steven Kleinman, who knew psychologists Mitchell and Jessen from his time at the SERE school in Spokane. SERE—Survival, Evasion, Resistance, Escape—is a secretive program which teaches soldiers to endure captivity in enemy hands. Mitchell and Jessen reverse-engineered the tactics taught in SERE training for use on prisoners held in the CIA’s secret prisons. AMY GOODMAN: This is Democracy Now!, democracynow.org, The War and Peace Report. I’m Amy Goodman. We’re on the road, broadcasting from the television studios of Bellevue College, just outside Seattle, Bellevue College, home of community radio station KBCS, as well. Well, here in Washington state last month, Federal Judge Justin Quackenbush allowed a landmark lawsuit to move forward against the two psychologists who designed and implemented the CIA’s torture program. Psychologists James Mitchell and Bruce Jessen reaped more than $80 million for designing the torture techniques used by the CIA. The case was brought by Suleiman Abdullah Salim and Mohamed Ben Soud, two survivors of the CIA program, along with the family of Gul Rahman, who froze to death at a CIA black site in Afghanistan. All three men were subjected to torture techniques that Mitchell and Jessen created and helped implement for the CIA. Among the torture techniques were beatings, being held in coffin-sized boxes and being hung from metal rods. This is Suleiman Abdullah Salim speaking to the ACLU about the long-term impacts of the torture he endured. AMY GOODMAN: That’s torture victim and plaintiff Suleiman Abdullah Salim speaking to the ACLU. The headquarters of the psychologists’ secretive military contracting firm, Mitchell Jessen and Associates, was headquartered here in Washington state near the Fairchild Air Force Base in Spokane. Beginning in 2002, the CIA hired the psychologists to train interrogators in brutal techniques, including waterboarding, sleep deprivation and pain. Both of the men had years of military training in a secretive program known as SERE. That’s SERE—Survival, Evasion, Resistance, Escape—which teaches soldiers to endure captivity in enemy hands. Mitchell and Jessen reverse-engineered the SERE tactics for use on prisoners held in the CIA secret prisons. For more, we’re joined in New York by ACLU lawyer Dror Ladin, who has filed suit on behalf of torture victims. And in Santa Barbara, California, we’re joined by former intelligence officer, Colonel Steve Kleinman, who knew psychologists James Mitchell and Bruce Jessen from his time at the SERE school in Spokane. He worked with them. We welcome you both to Democracy Now! I want to go first to Dror in New York. Explain the significance of this lawsuit and the judge’s ruling. 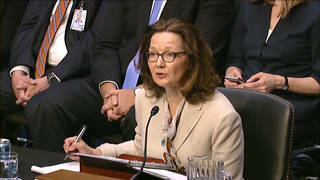 DROR LADIN: In every previous CIA lawsuit involving the CIA’s torture program, the government had always intervened, even before the suit got underway, to shut it down. They had always claimed that no matter how much information had previously been made public about CIA torture, that it was just too secret for courts to handle. This lawsuit, that didn’t happen. So this is the first lawsuit that was filed after the Senate released its torture report, in which the Senate Subcommittee on Intelligence exposed an enormous amount of information about the CIA’s torture program. And after that came out, our clients decided that they could finally try to seek justice for what was done to them. And so, this report both disclosed the torture of our clients as well as describing the role of Mitchell and Jessen in designing and implementing and profiting from their pain. And amazingly, in this lawsuit, the government did not try to shut it down, which meant that Mitchell and Jessen were the ones who had to try and shut it down. And so, we were in court two weeks ago to hear argument about Mitchell and Jessen’s attempt to get the case dismissed. And in the first time ever, the district judge, Judge Quackenbush, denied entirely the defendants’ motion to dismiss, and the case is moving forward to discovery, which has never happened before. AMY GOODMAN: And explain who the plaintiffs are, Dror. DROR LADIN: So, there’s Suleiman Abdullah Salim. He is a Tanzanian fishermen. He lives in Zanzibar. He never—not only did he never pose a threat to the United States, you don’t even have to take our word for it, because the Department of Defense gave him a certificate, after he had been held for five years, after he had been tortured. And the certificate said that Mr. Salim does not pose a threat to U.S. forces or interests. But even so, you know, they destroyed his life with torture. And he is now living in Zanzibar with his wife and child. The second plaintiff is Mohamed Ahmed Ben Soud. He is a marble worker in Libya. He also never posed any threat to the United States, and he was never charged with any crime. Unfortunately, the third plaintiff, it’s his family that’s the plaintiff, because Gul Rahman was killed during his torture, so he never got to go home and try to rebuild his life. He froze to death on a bare floor. After he had been tortured for days, he finally succumbed to hypothermia. And all of that is detailed in the Senate report. AMY GOODMAN: Steven Kleinman, Colonel Steven Kleinman, former military intelligence officer, you worked with Mitchell and Jessen at the SERE school here in Washington state in Spokane. Can you explain who they were and what your interactions were with them? STEVEN KLEINMAN: I’d be happy to. And this may come as a surprise to most of your listeners, because it’s easy to really portray this as as some Greek tragedy where there’s evil spirits moving across this geopolitical landscape, when in fact both retired lieutenant colonels, Bruce Jessen and Jim Mitchell, they were instrumental in creating arguably the best resistance-to-interrogation program in the world. And they were motivated by the mission of returning with honor. You mentioned earlier, in the introduction, about they ultimately then reverse-engineered. And, see, that’s where the problem lies. It’s not really a reverse-engineering, because what we do at a SERE school, what we portray is what was called a communist interrogation model. And again, Bruce Jessen and Jim Mitchell were instrumental in developing—deconstructing what went on in the most brutal, austere circumstances, and then helping to design strategies to resist. And that’s—but that’s the extent—although it’s very important, that’s the extent of their experience. The problem is, they are two very bright individuals and, again, decorated veterans of the United States Air Force, but what they didn’t understand was they were not interrogators. They had never observed a real-world interrogation. They weren’t involved with intelligence operations. They weren’t involved with Islamic or Arabic or Middle Eastern cultural issues. But they found themselves, by the approval, literally, of the director of central intelligence, in the middle of a—what I describe as a torture program, without hesitation. So it’s interesting. If their story had ended upon their retirement from the Air Force, I think we would sing them as heroes, rightfully so. But they—I’m not going to question their intentions. I mean, I’m quite certain they thought they were going to keep America safe. But their methods, as just been described by your first guest, were brutal and heinous, inexcusable. And above all that, they’re not effective in terms of eliciting useful information from detainees. AMY GOODMAN: I wanted to turn to VICE News in 2014. James Mitchell was interviewed and asked if the CIA’s so-called enhanced interrogation techniques, or EIT, were designed to get actionable intelligence. This was his response. JAMES MITCHELL: It was to facilitate getting actionable intelligence by making a bad cop, that was bad enough that the person would engage with a good cop. I would be stunned if they found any kind of evidence to suggest that EITs, as they were being applied, yielded actionable intelligence. AMY GOODMAN: That was—that was Jessen [sic] speaking to VICE News. That was Mitchell speaking to VICE News. I want to go to the second part of that clip. JAMES MITCHELL: To me, it seems completely insensible that slapping KSM is bad, but sending a Hellfire missile into a family’s picnic and killing all the children and, you know, killing Granny and killing everyone is OK, for a lot of reasons. One of the reasons is: What about that collateral loss of life? And the other is, is that if you kill them, you can’t question them. AMY GOODMAN: That’s James Mitchell. Can you respond to that, Dror Ladin? DROR LADIN: What you have there is an admission that all they were doing was trying—you know, for all the scientific language it was all dressed up in, with learned helplessness and experiments that go back decades, really all it was was about inflicting an enormous amount of pain on people, with the idea that if you abuse them enough and you broke them down enough, they’d do whatever you wanted. And, you know, whether you’re talking about a bad cop in a Chicago PD basement or whether you’re talking about a secret black site, that’s what this was. It was hurting people so much that they would do whatever you told them to do. You know between that and—I don’t think it exonerates, you know, Mitchell’s program in any way to say that drone strikes are also bad. Drone strikes are—you know, that kill innocent people, are—of course they’re bad. But that doesn’t make torture good. AMY GOODMAN: Colonel Steven Kleinman, were you always against torture? STEVEN KLEINMAN: Absolutely, absolutely. I mean, I have a moral code. I’m a second-generation military officer. My father was a principled World War II vet. He taught me how to sort out life. AMY GOODMAN: I want to just ask you: Do you think it’s enough to hold Mitchell and Jessen accountable, these two psychologists? STEVEN KLEINMAN: Absolutely, absolutely not. You know, I’m not going to defend for a moment what they did, but what I will defend is, they did not—they did not create policy in this country. We have a gentleman, Director Tenet, George Tenet, of the CIA. Why didn’t he say, “Wait a second, you’re proposing a program for which we have no data to support it, and you have no experience in interrogation”? So, there are people so far above doctors Jessen and Mitchell who made this possible, and without them being held accountable, if we’re giving them, in fact, Medals of Freedom to move on to their life, it’s a travesty, I think. AMY GOODMAN: We’re going to have to leave it there. Colonel Steven Kleinman, former military intelligence officer, who trained in interrogation, trained soldiers in interrogation. And I want to thank Dror Ladin of the ACLU. And that does it for this program. I’ll be speaking tonight at Seattle Town Hall at 7:30; Saturday at Mount Vernon at noon at the Lincoln Theatre; Sunday in Eugene, Oregon, University of Oregon, and in Portland at 7:30 at the Aladdin Theater. You can go to our website at democracynow.org.